"DJ software with extended features including karaoke support"
Professional DJs and entertainers can use this software to import, mix and search all their music files quickly and easily for playback mixing. It supports audio formats like MP3, WAV, OGG, WMA and FLAC. The most important features of PCDJ Red include karaoke show hosting with the ability to playback MP3+G karaoke files, display the lyrics on an external monitor. There is support also for automated auto-mix, a mix-now button allowing quick cross-fade play and one-click beat sync. 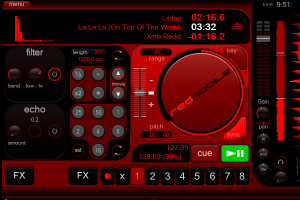 PCDJ Red has a graphical interface similar to other DJ software with the classic DJ set-up consisting of two decks with a mixer and a track library. Every function is at hand and easy-to-use, packaged to offer a great DJ solution that meets the needs any gig in any environment require. There is even vinyl simulation including scratch, reverse play and pitch so you still can play out your acquired turntable skills.